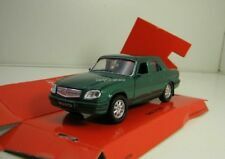 RARE 1/43 VOLGA GAZ 31105 RUSSIAN USSR POLICE CAR IN BOX.10 YEAR.OLD NEW STOCK. Volga GAZ-31105 "Fire Service" 1/43 scale model "Autogrand"
This page was last updated: 26-Apr 01:12. Number of bids and bid amounts may be slightly out of date. See each listing for international shipping options and costs.